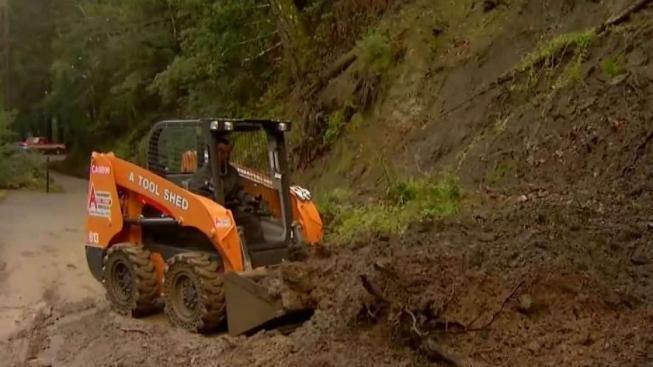 A mudslide blocked an access road to a winery off Highway 9 in Saratoga on Sunday, according to authorities. Mud and rocks covered a portion of the road off Big Basin Way leading up to the Savannah Chanel Winery in the Saratoga foothills. Crews were busy trying to clear the slide by Sunday evening. The slide forced the popular winery to close for the day, and owner Michael Ballard said it wasn't the first time. "Three years in a row," he said. "Since the drought broke, and we had the first big rain, this slide fell. And unfortunately, this is just at the entrance to our driveway." Patrons were unable to get to the winery for most of the day Sunday due to the mudslide. Some customers showed up to pick up wine for their Super Bowl parties, and winery workers had to walk the bottles down the driveway and over the mud to deliver it.